As noted by Chris when the lovely poster for High Life premiered earlier this week, Claire Denis doesn't exactly deliver crowd pleaser material but if the teaser trailer and the newly minted trailer for her upcoming movie is any indication, she's definitely hitting all the right buttons for this viewer. Set in the future, the movie stars Robert Pattinson as a guy struggling to survive on a spaceship with his baby daughter. How did he get there? The new trailer suggests an apocalypse not unlike that imagined in Children of Men, with Pattinson, André Benjamin and Mia Goth being selected for a possible dead-end mission by Juliette Binoche. 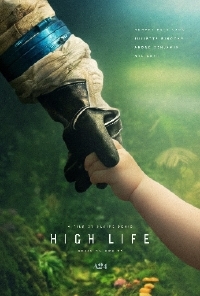 The initial response to High Life has been very mixed - everything from great to abysmal - but this trailer suggests that for some viewers, myself included, this is must-see summer entertainment. High Life opens April 12. Are you in?